The "Take It!" comes from a long time enjoyment of a last minute modification request I made many years ago when doing a retrofit of a window that was placed on the side of the tub/shower in the main bathroom of the house. The original house had a plain slide window as the installation which was unsatisfactory in that it caught water and was difficult to find appropriate covering for. I contacted a glass block company and looked at a number of blocks that provided privacy through their design which included lots of distortions shaped into the glass. At the last minute I asked for the top two tiers of blocks to be in clear non distorted glass to allow anyone using the shower to be able to have both privacy and a little bit of a view looking upward at the trees that are in the back yard. The glass company had never done that before but went along with it. The After Take: As mentioned above, this has been an installation of long standing. The enjoyment I have had with this bit of simple view has been grand. Guests have commented that they too have enjoyed this little bit of a view. Not that the wall had it been all distorted glass would have been claustrophobic, this just offers a little bit of contrast. This is one of those "share the stuff" photos. Perhaps you may wish to contemplate a similar installation should occasion offer you the same opportunity. Here is the hope you have had a great day and even if for a moment, taken time to enjoy some views of nature. Thanks for joining us for the current photo presentation. You are cordially invited to return Friday April 27 for a new picture that we hope you will enjoy. 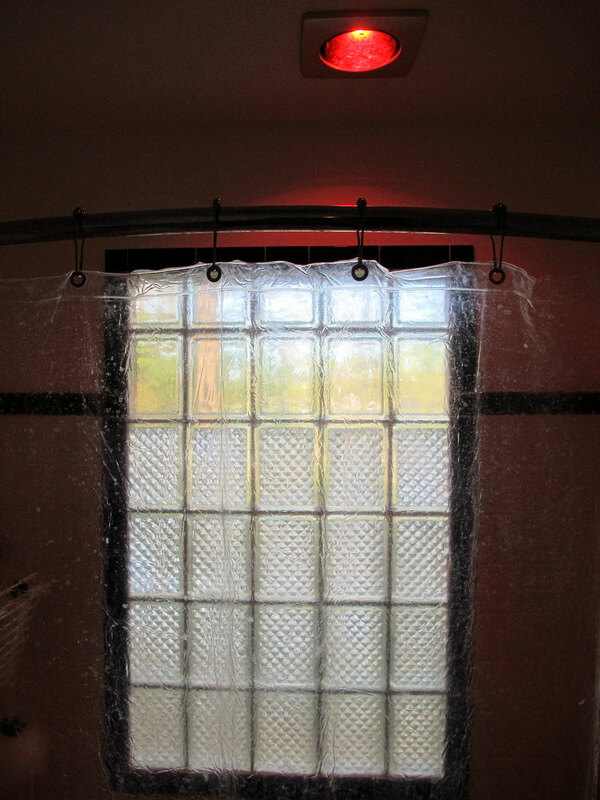 I dunno if I could handle having any part of my window not blurry in the shower. Something about the neighbors being able to see me bath would be a little awkward for me. Hey if its a good view go for it. my bathroom is windowless. On the one hand I prefer it that way, but I can see where having the sunlight would be a cheerful addition to an early morning shower. Wouldn't it be cool to have something like that going all the way around. 360 degree view lol. Lol, ya that would be pretty neat. Would imagine that a bit of a view would be a treat and the sunshine a definite bonus to start the day!